As the leaves are now definitely falling off the trees, it's about time that I embrace that it is officially Autumn. Hey, that's ok because Autumn has one of my favorite holidays...Thanksgiving! For Americans Thanksgiving is a practically sacred holiday. Traditions are as much part of the day as the turkey + stuffing is. For my family we always watch the Macy's Thanksgiving Parade + National Dog Show together while sneaking bites of the feast my mom prepares every year. We dive into dinner with our extended family at a large table, digging into roasted turkey, sweet potatoes, roasted vegetables--basically the works. The meal is finished up with pumpkin pie + pecan pie. A slice of each because January is for diets. While food is the main event of Thanksgiving, I always feel like salad gets shafted. It's clear to see why salad does not seem as extravagant in comparison, but I swear this harvest salad is the game changer. This salad shines when on a large platter with the roasted acorn squash parading around the serving dish. 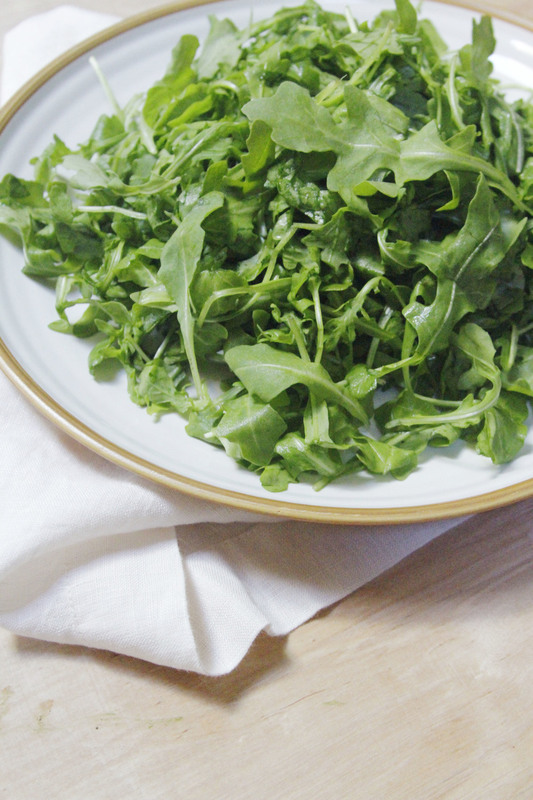 Peppery arugula works well against the sweet flavor of the dressing. Speaking of the dressing, it serves two purposes--as a dressing, but also as a marinade for the acorn squash while it roasts. The dressing is sweet (due to the maple syrup! ), but that sweetness is cut by apple cider vinegar + dijon mustard. Tangy goat cheese + crisp pear finish the whole thing off. And damn, it looks pretty once assembled. Do you mind if I interrupt my listing of ingredients to chat about something really cool? To celebrate the Thanksgiving, Meghan from Cake ‘n Knife and Susannah from Feast + West are hosting Blogsgiving Dinner. There are more than 60 blogs sharing recipes this week! These lovely ladies are organizing an online potluck dinner party of sorts. Each blogger participating will be sharing a recipe for this virtual Thanksgiving meal. This is a great opportunity to find a few new recipes to add to your traditional Thanksgiving recipes. Hope you're hungry! I'll be posting to social media with the hashtag #blogsgivingdinner alongside the other bloggers participating, but you can see all the whole menu in Part 1 and Part 2 of the recipe round-up. Prepare the acorn squash by cutting it in half. Remove the seeds + cut each half into four even slices. Place in a shallow baking dish. Set aside. Whisk the dressing together, combing the olive oil, balsamic vinegar, maple syrup, apple cider vinegar + dijon mustard. Add salt + pepper to taste. Pour 1/4 cup of the dressing on top of the acorn squash. Add the cinnamon + toss to coat the squash in the mixture. Reserve the rest of the dressing for assembling the salad. Roast the squash in the oven for 20 minutes on one side. Remove the squash from the oven + flip each slice. Roast for another 20 minutes until golden brown + tender. Assemble the salad right before serving. 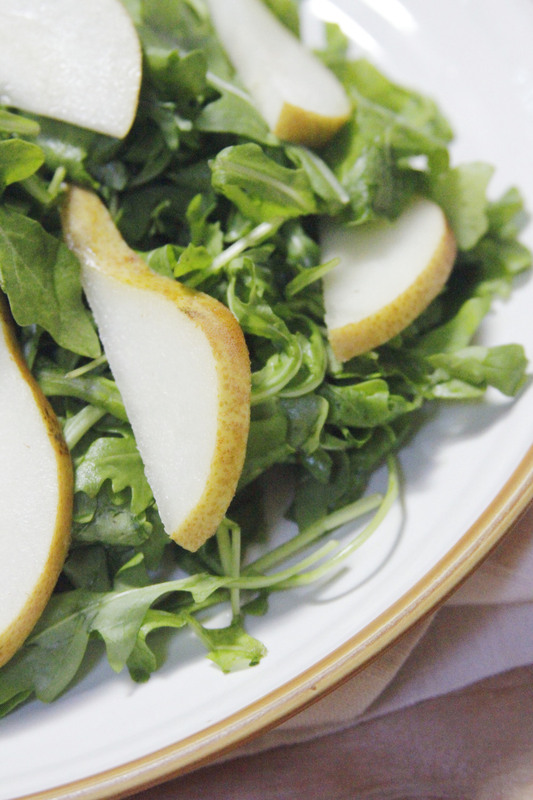 Combine the arugula + pear with desired amount of reserved dressing. Top with crumbled goat cheese. Serve each portion of salad with a slice of acorn squash.